We all know that movies and real chala different. But konni situations, movies lo chusi ala untayi ani manam asa padutuntam and inkonni sarlu real life incidents ni tesukune movies testuntaru. Ivala manam a first category gurinchi discuss chesukundam. Hostel life ni chala mandi experience ayye untaru and it is completely different in expectations and reality. First lo movies lo ilane untayi anukuni chala feel apoyi, hostel lo unta ani gentukuntu elipotam. 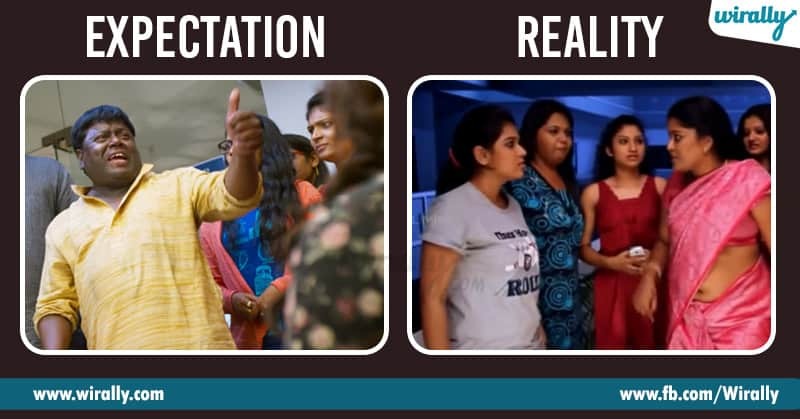 Asalu expectations ela untayo reality ento ipudu chuddam. Expectations: Hostel anagane neighbour aunties undaru, parents undaru and relatives undaru, manaku nachinatu manam undochu and we can wear whatever we want anukuntam. Reality: Intlo kante goram ga oka loose t-shirt vesukuni, nidramohaniki care of address laga untaru kondaru and e strict hostel wardens valla shorts alantivi allow cheyaru konni chotla. Expectation: Evo movies lo chupinchinatu ragginglu alantivi undavu and e cat fights edo pai paina kuda undavu. Reality: The fights are intense and involve so much propaganda. Almost Bigg Boss house lo godavalu laga untayi, gossips epudu chudu ade discussions. Mamuluga undavu. Expectation: Mana safety alochistaru and chala friendly ga untaru. Reality: Mana parents kantey too much chestu untaru kondaru. Bayata abbayitho kanipinchama, inka antey ventane parents ki call chesestuntaru. Relation lo unna, break up ayye daka nidraporu annamata. Reality: Asalu vaati gurinchi tappa anneti gurnchi matladukuntaru anukondi. Expectations: Movies lo chupinchinatu, epudu kavalante apudu veladam, epudu kavalante apudu ravadam, manchi food ilantivi anukuntam. Reality: Torture spelling rayistaru annamata. A rules ki enduku join ayama hostel anipinchetu chestaru. Expectation: Ammailu and ammailu chala baga friendly ga untaru and they are like soul sisters. Reality: Ala anukuntey adi tappe. Idaru kalisi moodo valla gurinchi bitching matram pakka chestaru. Manalo chala mandi chese untam, but oppukomu antey. Expectation: Most of the girls always discuss about their boyfriends and valani tesukochi introduce cheyadam and valichina gifts chupinchadam chestuntaru. Reality: Andaru ani kaadu, kontamandi aitey okesari three to four people tho relation lo untaru annamata. Idi movies lo kuda chupincharu and kondaru chestaru kuda. Of course chala mandi indulo konni face chesi undochu and undakapovachu, but ivi chala mandiki telisina nijalu.